Quality Center was initially a test management tool developed by Mercury interactive. It is now developed by HP as Application Life Cycle Management Tool (or) ALM that supports various phases of the software development life cycle. ALM also provides integration to all other HP products such as UFT and Load Runner. These stakeholders perform diverse set of activities that need to be communicated to all concerned team members. If we do not maintain centralized repository to record, maintain and track all the artifacts related to the product, the project will unquestionably FAIL. We also need a mechanism to document and collaborate on all testing and development activities. It enables all the stakeholders to interact and coordinate, to achieve the project goals. It provides robust tracking & reporting and seamless integration of various project related tasks. It enables detailed project analysis and effective management. ALM can connect to our email systems and send emails about any changes(like Requirement change, Defect raising etc..) to all desired team members. It is important to understand the history of ALM. Quality Center was earlier known as Test Director which was developed by Mercury Interactive. In 2008, Version 8 was released and the product was renamed as Quality Center. Later, HP acquired Mercury Interactive and rebranded all mercury products as HP. 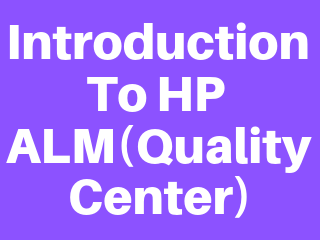 In 2011, Version 11 was released and Quality center was rechristened as HP ALM. Now let us understand the technology part of HP-ALM. ALM is an enterprise application developed using Java 2 Enterprise Edition (J2EE) that can have MS SQL Server or Oracle as its back end. ALM has 3 components – Client, Application Server and Database Server. HP ALM client: when an end user/tester accesses the URL of ALM, the client components are downloaded on the client's system. ALM client components help the user to interact with the server using .NET and COM technologies over a secured connection (HTTPS). ALM server/Application server: Application server usually runs on a Windows or Linux platform which caters to the client requests. App server makes use of the Java Database Connectivity (JDBC) driver to communicate between the application server and database servers. Database servers: The Database layer stores three schemas. Site Administration schema: It Stores information related to the domains, users, and site parameters. Lab Project: This schema stores lab information related to functional and performance testing on remote hosts, Performance Center server data. Project schema: Stores project information, such as work item/data created by user under the project area. Each project has its own schema and they are are created on the same database server as the Site Administration schema.